Disclosure: Thank you to Nature's Path for sponsoring this content. Product was provided to me free of charge in order to facilitate this content. All thoughts and opinions expressed below are my own. For more information, please refer to the disclosure that can be found at the bottom of this post. I remember being a kid and seeing EnviroKidz cereal in a grocery store for the first time. It was love at first sight. As an animal lover from the start, I couldn't turn away from the adorable animal packaging, and the cereals looked so tasty, too! I found the cereals to be hearty and wholesome, which is why EnviroKidz products became a household favorite. There were so many mornings where my siblings and I fought over who would get the last of the cereal left when we were running low! Nature's Path has dozens of amazing natural food products, and provides even more healthy food and snack options to families with the EnviroKidz line. Consumers can shop with confidence knowing that all Nature's Path and EnviroKidz products are certified organic and non-GMO project verified. Fall in love with products such as their Love Crunch® Premium Granola, Toaster Pastries in plain and frosted varieties, and irresistible varieties of bars from their Mocha Cocoa Hazelnut Qi'a Superfood Bars to the EnviroKidz Cheetah Berry Blast Crispy Rice Bars. They also have an extensive line of gluten-free products! Food is such an important part of our lives, and it can provide some wonderful learning opportunities for our children as well. The #HelpGoodThingsGrow campaign aims to provide children with the opportunity to learn about how food grows. Involving kids in gardening activities is an amazing way to interest them in eating healthier, and leading more active lives. The understanding and involvement with their own food can also teach them valuable things about the environment we all live in, and encourage them to take an interest in caring for their communities and the planet. 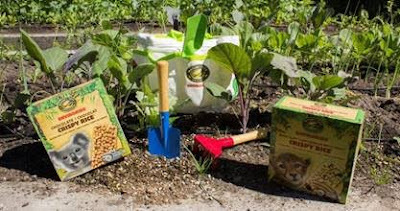 EnviroKidz has generously offered an amazing gardening kit to one lucky winner! Just the thing to help you get started with gardening with your child, and interest them in the activity. Read all about the giveaway and enter to win below! Nature's Path has a commitment to helping preserve our planet. They partner with incredible organizations such as the Jane Goodall Foundation, Defenders of Wildlife, See Turtles, and the Amazon Conservation Team. 1% of all Envirokidz products sales are donated to organizations just like these, with more than $2.3 million raised to date! Find out more to find out what Nature's Path is doing to help the planet. Open to residents of the United States and Canada. Giveaway ends 08/23 at 11:59 pm PST. Fine Print for Giveaway: Giveaway open to individuals 18+ who are residents of the United States and Canada. Entries are limited to one person per household. Giveaway begins July 27, 2015 at 7 pm PST, and ends August 23, 2015 at 11:59 pm PST. The winner of the giveaway will be chosen at random through Giveaway Tool's Random.org. Winner will be notified via email, and first name and last name's first initial will be announced on the Found Frolicking blog. Please make sure your email address is correct when entered, so that you can be reached if you win. The winner will have 48 hours to respond to the email sent out to them, and should a response not be received within that time, the prizes are forfeited. Please follow the instructions for each entry, as you have to have done what was instructed for your entry to count. All entries will be verified. Found Frolicking is in no way responsible for prize shipment, but will work with the sponsors in all ways possible to ensure the winner receives their prize. Void where prohibited. Entering using the Giveaway Tools form means you agree to the above terms. Thank you. I would like the Qi'a™ Superfoods Hot Oatmeal Cinnamon Pumpkin Seed http://us.naturespath.com/product/qiatm-superfoods-hot-oatmeal-cinnamon-pumpkin-seed I am on foundfrolicking.com.